The Strapack AQ-7PLT packaging machine is a reliable device for fastening pallets placed on pallets with PP and PET tapes. Currently it is the only machine on the market that can be used to fasten PP and PET tapes without having to replace any machine elements. For strapping products you can use tapes of internal diameter 408 mm and outer roll width 150 mm and 200x200mm. 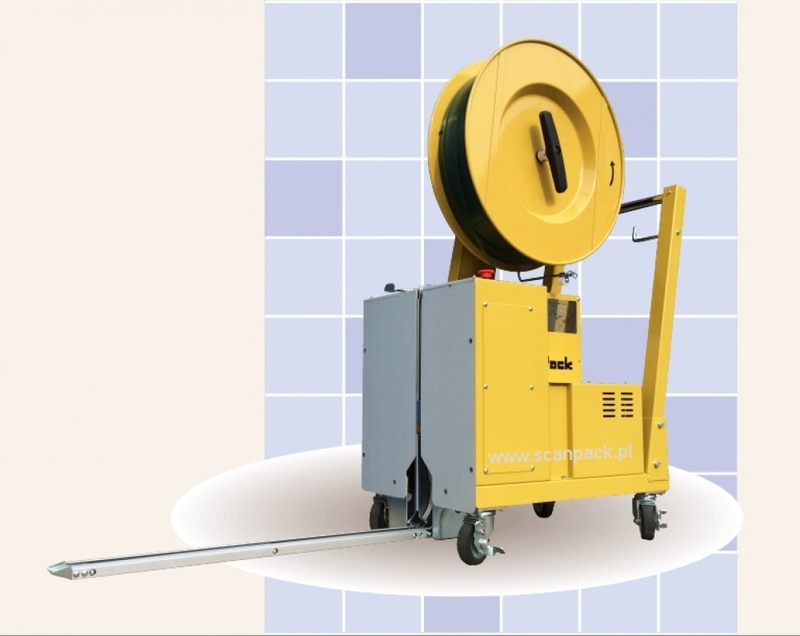 The clamping head does not require any special maintenance or lubrication. For the operator's convenience, the machine is equipped with a panel for controlling and setting the machine's operating parameters. On the contrary, the tape feeder START switch is located both at the rear and at the front of the machine. The operator uses a potentiometer to set the belt tension in the range of 1-10. The maximum tension of the belt is 70 kG. Similarly, the required length of the tape is set. For fastening small (low) pallets, the weld point is only 351 mm above the floor. Minimum package height is 390mm. Wheels made of durable metal allow for quick movement of the device for connection to any single-phase outlet or to park after finishing work. Foldable heavy metal bayonet for easy use. Robust machine design and high quality components guarantee long and trouble-free operation in industrial environments.